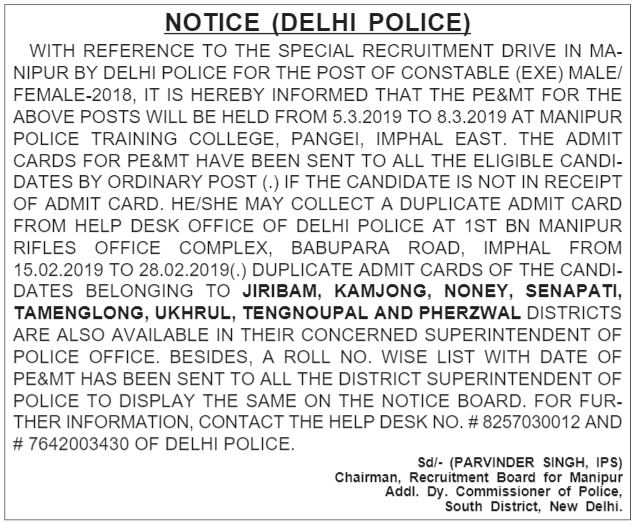 Delhi Police has released date for Physical Endurance and Measurement Test (PE & MT) for the special recruitment drive for the natives of Manipur having domicile of Manipur for the post of Constable (Executive) in Delhi Police in the pay scale of PB-1. According to the notification released it has been informed that PE & MT will be held from 5th March to 8th March 2019 at Manipur Police Training College, Pangei Imphal East. Note: 03% reserved for ex-servicemen, & 05% reserved for sportsmen, refer official notification. Note: Age relaxation for sportsmen & Ex-servicemen applicable, refer official notification. The recruitment is only for natives of Manipur (those having Domicile certificate of Manipur issued by competent authority).